India has 254,000 members of the top 1% of global wealth holders,which equates to a 0.5% share. The Credit Suisse Research Institute on Wednesday released its fourth annual Global Wealth Report 2013,which found wealth in India rose by 7.4% to $3.6 trillion in mid-2013. “As the world’s largest democracy with a strong federal structure and vibrant markets,India has seen rapid growth in wealth since the year 2000,” the report said. 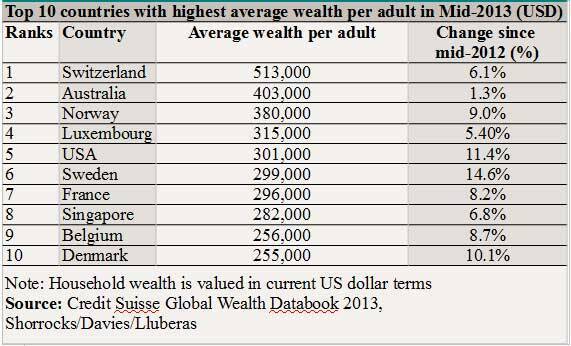 According to the Credit Suisse Global Wealth Report 2013,after North America (11.9 per cent) and Europe (7.7 per cent) India has witnessed the highest rise in household wealth. 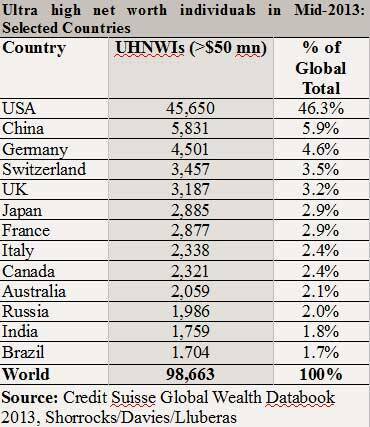 Globally,household wealth increased by 4.9 per cent to over USD 240 trillion,Credit Suisse said adding that the US accounted for 72 per cent of the increase. While wealth per adult rose at an average annual rate of 8% from $2,036 in 2000 to $4,700 in 2013,just 0.4% of the Indian population has net worth over $100,000. Meanwhile,the average wealth per adult globally reached a new all time high of USD 51,600. The report also found that like most countries in the developing world,personal wealth in India is heavily skewed towards property and other real assets,which make up 86% of household assets. While wealth has been rising strongly in India,and the ranks of the middle class and wealthy have been growing,there is still a great deal of poverty. This is reflected in the fact that 94% of the adult population has wealth below $10,000,it stated. At the other end of the scale,just about 0.4% of the population has net worth over $100,000. But due to Indias large population,this translates into 2.8 million people. India also has 254,000 members of the top 1% of global wealth holders,which equates to a 0.5% share. In total,there are 1,760 ultra high net worth individuals with wealth over $50 million and 770 more than $100 million. According to the Credit Suisse report,the number of millionaires in India is expected to rise from 182,000 in 2013 to 302,000 by 2018 and wealth per adult in India is expected to rise at a CAGR of 9.3% to $6,600 by 2018. “Our fourth edition of the Global Wealth Report reconfirms again that Asia Pacific,which accounts for 31% of global household wealth and 61% of the world’s middle class of emerging consumers,remains the key growth engine of the world economy and wealth creation, said Toral Munshi,Credit Suisse Head of India Equity Research,Wealth Management. “As the worlds largest democracy with a strong federal structure and vibrant markets,India wealth has seen rapid growth since the year 2000. Wealth per adult has risen by 135% from $2,000 in 2000 to $4,700 in 2013,at an average rate of 8%, Munshi added. Globally,wealth increased by 4.9% in current dollar terms to $241 trillion from mid-2012 to mid-2013 aggregate global household. North America overtook Asia Pacific and Europe to be the wealthiest region with an 11.9% wealth growth to $78.9 trillion,fuelled by a recovery in house prices and a bull equity market in the US. As a result of a 22% depreciation of the Japanese yen against the US dollar during the period,household wealth in Japan dropped 20.5% to $22.6 trillion,leading total wealth in Asia Pacific to decline by 3.7% to $73.9 trillion. However,Asia Pacific ex-Japan continued to register stable wealth growth of 6.2% to $51.3 trillion in mid-2013,with India registering USD3.6 trillion in total wealth,an increase of 7.4%. The Global Wealth Report 2013 found that from mid-2012 to mid-2013 total global household wealth rose 4.9% or $11.3 trillion in current dollar terms to $241 trillion,while average net worth reached an all-time high of $51,600 per adult from $49,990 last year. North America became the world’s wealthiest region for the first time since 2005,gaining 11.9% or $8.4 trillion to reach $78.9 trillion. Despite the continuing challenges posed by the economic environment this year,Europe added $5.5 trillion in household wealth,an increase of 7.7%. Eurozone wealth per adult by mid-2013 has recovered more than half of the large loss experienced 12 months earlier,mainly due to rising equity prices.